Stephen Sackur is in Bogota, Colombia. He asks president Juan Manuel Santos about his efforts to bring stability to his country and achieve peace with the revolutionary group FARC. Stephen Sackur is in Bogota for a special edition of HARDtalk. For many years Colombia was a country of car bombings and kidnappings fuelled by a political insurgency and drugs trafficking. But Colombia has changed. 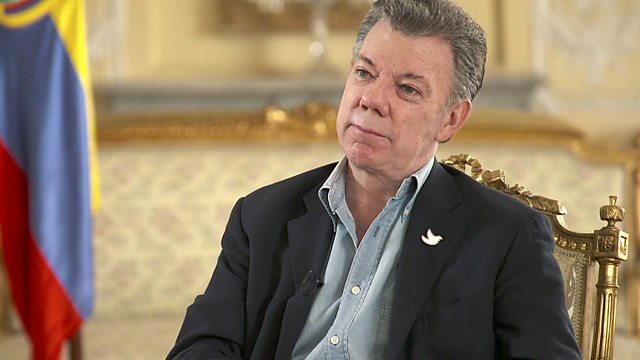 HARDtalk's guest is the president of Colombia, Juan Manuel Santos. He is the driving force behind a peace process with the armed rebel group, the revolutionary movement: the FARC. The process is difficult and divisive but will it end in success?